St Benedict’s aims to provide opportunities to develop and cultivate leadership qualities within all students. We aim to instil in students a strong sense of social justice through the service of others. Students from Year 6 are all eligible to become school leaders. At the end of Year 5, potential School Captains present a speech to the school community. The student body, as well as staff members, elect Captains, Vice-Captains and Colour Captains. The School Captains, Vice-Captains and Colour Captains, as well as all of Year 6 (senior leaders) are presented with their badges at the opening school Mass. Mini-Vinnies leaders are also presented with their badges. The leaders perform a number of ceremonial roles on special occasions and are responsible for setting a good example of being responsible, respectful and safe at all times. 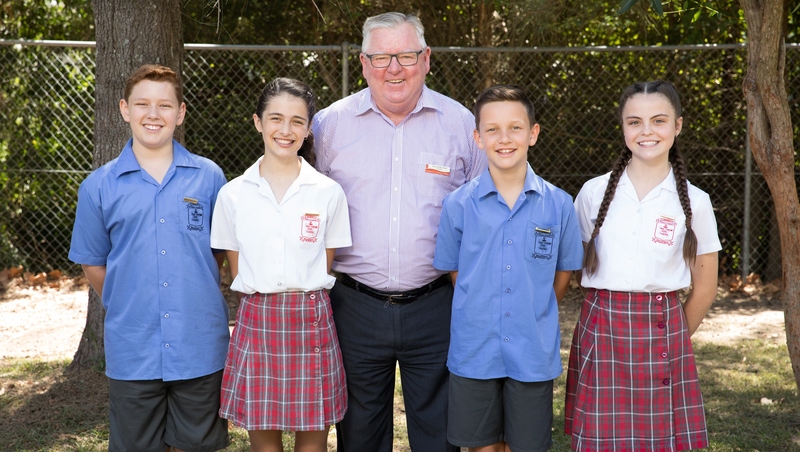 They also often meet and liaise with the Assistant Principal and form part of the School Representative Council (SRC). Elected representatives from Years 3 to 5 also form part of the SRC. The SRC meets twice each term to discuss issues and implement initiatives that are suggested by the student. The School Captains are also responsible for running the school assembly. They have responsibility for the care of sports equipment, maintaining house enthusiasm in sporting activities and representing the school at community and special functions including the ANZAC March, Australia Day celebrations and Catholic Schools Week. Senior students also organise and run Getting Along Day as part of the ‘You Can Do It’ program. The leaders see a major part of their role to be problem solvers and forward thinkers. The leaders run the Mission Day activities throughout the year and other social justice initiatives as they arise.